As with other high profile gaming consoles, the X Box has also entered the karaoke arena, but due to advanced technology, do so with a bang in the shape of cordless microphones. 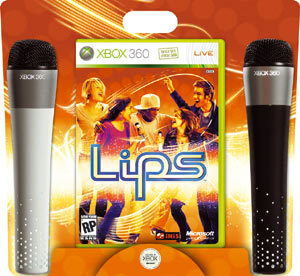 The Lips game comes with these two mics (batteries included), and 40 songs spanning a wide range of genres and styles. You get old-school classics like Ben E. King (Stand By Me), Jackson 5 (ABC), Johnny Cash (Ring Of Fire), and Earth Wind & Fire (Let’s Groove); Rock variants like Queen (Another One Bites The Dust), Nirvana (In Bloom), Ramones (I Wanna Be Sedated), The Police (Every Little Thing She Does Is Magic), and Weezer (Island In the Sun); ‘80s favourites from a-ha and Blondie to Duran Duran and The Bangles; some Indie and Alternative tracks like The Cure, Depeche Mode and Radiohead get countered by current female pop fluff from Beyonce, Duffy, Alicia Keys, and Rihanna. Seal, Dido, Maroon 5, Roxette and Coldplay fans are also catered for. As to be expected, you get the music video as visual background while you slaughter the songs(!). Like other existing games of this kind, the pitch of your voice is captured, giving you an accuracy bar as you sing, resulting in good or poor scores. 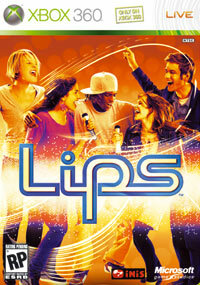 Various single and multi-player modes make this a handy voice training exercise, or a mere fun addition to any party. You can also allocate percussion sounds to your controls to play along with the beat when you’re not singing, and devices like iPods can be connected to sing along to your own choice.